Hey guys! Hope you had an amazing Thanksgiving with family and friends. Our family was in town from Idaho, so we actually got to have Thanksgiving dinner with both sets of parents! It was wonderful. 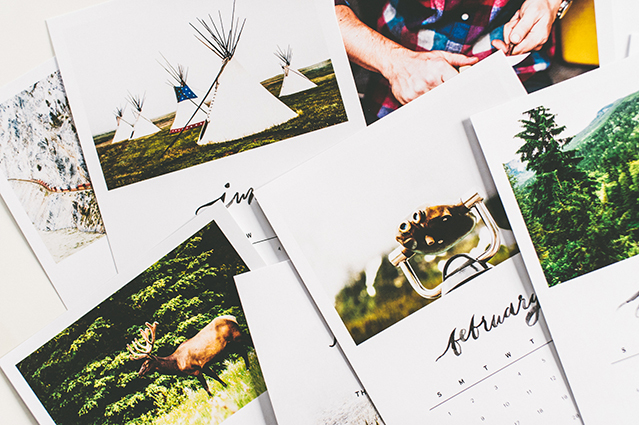 We just did a big shop update—added 2015 calendars AND updated the shop design! In honor of Black Friday, use code "Friday" to get 20% off the entire shop. That includes calendars, prints, t-shirts... everything. The sale will run through the end of Monday, Dec 1. 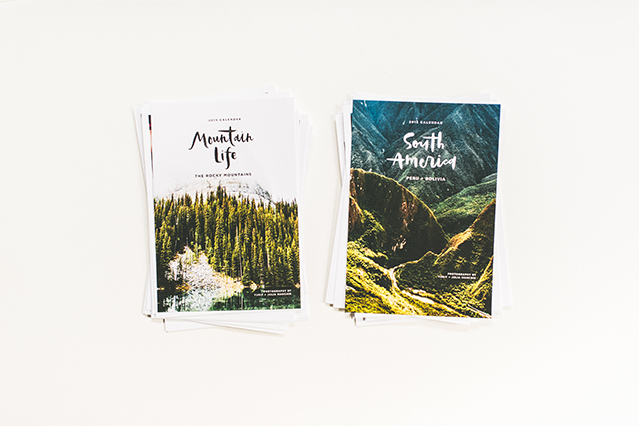 Giveaway: Leave a comment on this post telling us about a trip you want to take in 2015 for a chance to win a free calendar of your choice. Giveaway ends Monday, December 1 at 11:59pm PST. Winner will be announced on Tuesday, December 2. If you make it to Argentina, fell free to contact me with any questions you may have. It´s a huge and beautiful country! My dream trip for 2015 would be Italy. Keeping fingers crossed for it to become a reality! Happy Thanksgiving!! I would love to take a trip anywhere, honestly. Unfortunately we can't afford it this year - so I'll have to travel vicariously through your lovely photos! I would love to do a road trip along the Pacific Coast Highway up to San Francisco in 2015. I've always been fascinated and in awe of the wonderful landscape. I want to experience golden hour from Mount Tamalpais and be surrounded by the foggy atmosphere. Northern Peru... for the surfing, and the ceviche! I would like to take a trip to Canada! Such a big dream of mine! :). iceland! and I'm pretty sure I will. keeping my hopes up....it's my dream destination. My dream trip for 2015 is to continue the trip I started in 2014. In August my boyfriend and I left home (Ontario) to roadtrip and camp our way across Canada. We are currently settled in the Rockies where we will stay for the winter ski season, and in spring we're hoping to continue exploring BC before heading north to Alaska and the territories. We spent a good amount of time in Banff and Jasper, so some of our trip actually overlapped with yours. It has been really fun to see your photos of places we've recently been. I think your Mountain Life calendar would be an amazing way to remember this trip! AH! First of all, the new design on the Handle With Care shop looks goooorgeous. Congrats on yet another beautiful, beautiful set of calendars too! New Zealand - Top of my list for 2015...with Iceland close behind. Perhaps BOTH. Dreaming big. Bolivian Salt Flats with a close second being the pools of Pamukkale,Turkey. Love, love LOVE this mountain calendar!! I would love to take a trip to the Grand Canyon and Yosemite. I've lived in California for almost 10 years and have never seen the Yosemite or the Grand Canyon. Indonesia and Thailand is top on our list. ALASKA! A wilderness far from Tennessee. Love that mountain calendar - definitely going on my "must have" Christmas list! Colorado and Pennsylvania! And.....would love to reach the Summit at Mount Adams! 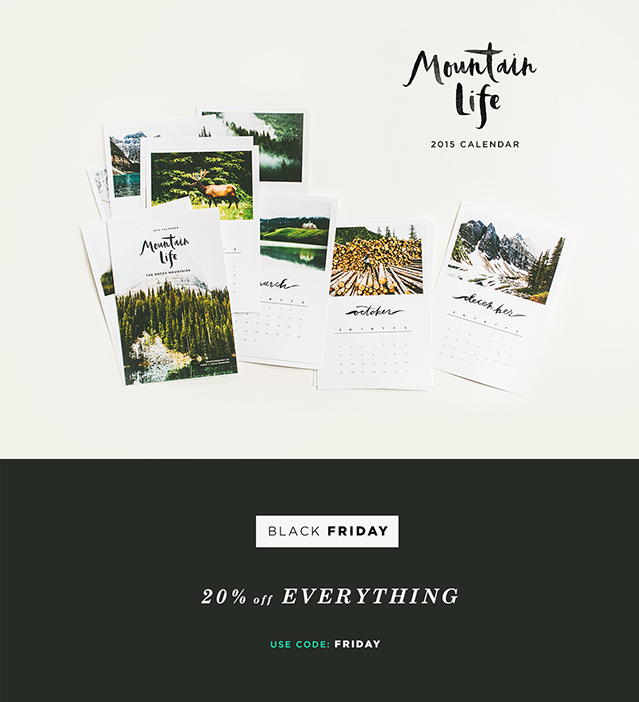 your Mountain Life calendar is gorgeous!! 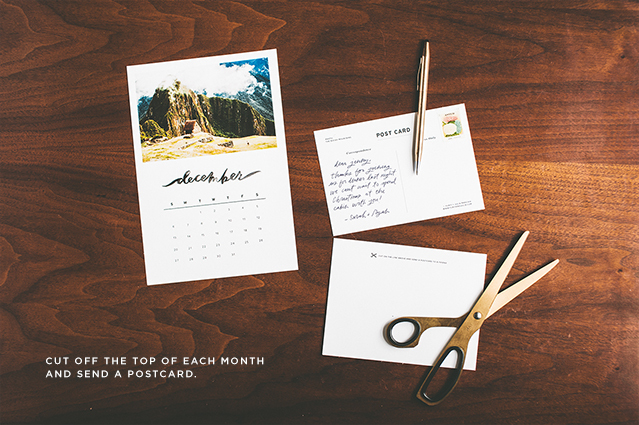 love that idea of using the top photos as postcard, it's brilliant! I'm really hoping to explore Scotland in 2015 and go hike in the Isle of Skye especially! I definitely want to visit Alberta after seeing all your fabulous pictures! Have plans for a trip to Norway in March. Your Iceland photos from month(year? )s ago have made my wanderlust return full force. There are 49 states I have visited in my many years, but the one state eluding me is Idaho. In 2015, I am determined to visit and photograph the beauty of Idaho, and to finish my "All America Journal"! My dream vacation is Iceland! There is no place I would rather travel this upcoming year. Planning a big hiking and kayaking trip with my best friend to either Belize or Peru! So excited!! I'm going on an interrail trip (travelling by train) through Europe during summer. My best friend and I will start in Greece and go through some Eastern European countries like Moldova, Bosnia, Croatia and Slovenia and also Italy and Austria. I think it will be an amazing trip and a good way to get to know more about the cultures in other European countries. I'm so excited! I'm absoluty in love with your South America calendar. I do love the pictures you took and I get this strong feeling I wanna visit the South American continent one day. I really want to visit Santorini and Dubrovnik. I fell in love with Santorini from the moment I watched A TV series located in the place, years ago. Hope I'll be there real soon. See Kasando Bosco's comment above -- Belize or Peru! We're so excited! These look so so so beautiful. I have a west coast (south california to british columbia) trip brewing in my mind. gah... too many places to explore! Portugal and Morocco! Crossing my fingers that I can make it happen. I am dying to go back to SW Utah to explore more slot canyons! Your calendars are stunning! Personally, I can't wait to go to South Korea (my motherland) in 2015! I've never been there before and as a Korean American woman now in her 20s, I feel like it's important to go and immerse myself in my "roots," so to speak. I'll also hopefully swing by Taiwan and Hong Kong before I leave, to visit some friends and scope out the best soup dumplings out there! We're hoping for Croatia in the Spring! My husband turns 30 in January and he still hasn't decided where he wants to go! I think India is high up on the list along with Bali but he's always drawn to America! Knowing him, we'll end up in LA or Kansas City! I would love to go to Andalusia...I'm currently drooling over Cereal magazine's Andalusia photo spread (http://readcereal.com/features/andalusia/). It looks like a photographer's dream. Oh there are so many me and my husband have been dreaming up! Grand Canyon / Zion National is definitely high up there (husband had never been! ), but highest would be Thailand (hopefully!!) when he graduates in December 2015! Norway. Norway a hundred times over. I would love to be able to go to Guatemala and Peru in 2015. They both have incredible food, culture, people, and views. Thanks so much for doing this giveaway! Even if I can't get anywhere, your Instagram is a great way to see the world. So many destinations on my list, but South Africa is currently at the top! So many dreamy surf spots! I would love to go to Iceland! Your photos from there last year were so inspiring. In 2015 I finally graduate medical school. The trip of a lifetime that I am hoping to make is to Belarus! An orgnaization called Chernobyl Children International asks medical volunteers to help come treat their children. As a graduation gift to our selves, (myself and 2 friends) are hoping to be able to travel there this May! I'll be starting off the New Year with my friends, road tripping along the East Coast, starting in Washington D.C. and going down to Charleston, SC. & if everything works out, I'm hoping to be studying abroad this summer in London! Oooo these calendars are so pretty. Your trips looked like so much fun! Well this year we are returning to Iceland, this time a week and a bit before our wedding. We are meeting our wedding photographers there and they will be capturing some stunning portraits for us at the end of our trip. Then we all fly back to Toronto and we get married 2 days later. Another trip we are hoping happens is a multi-state, multi-national park camping trip through Utah and Arizona, starting at Zion National Park. I really hope that one happens. Fingers crossed! I would love to go to Iceland and the hot springs of Japan! Kauai, HI...my husband and I honeymooned there 4 years ago. Love it...quiet...not touristy. Looking forward to a trip to South Korea and Japan in the summer. I am Korean, but I don't know much about the Korean culture. I've only been to Korea once but it was almost 20 years ago. Excited to experience my heritage and discover my roots. Iceland is our number one wish for 2015. Hopefully we will make it a reality in April. ireland! when i was young, my neighbors were irish. they stayed in the states for a few years before moving back (and then moving to england). i've been curious about ireland ever since! I'd love to get to the Canadian Rockies this coming summer. I go to school in BC but haven't gotten to explore much of Canada yet so it's at the top of my list! I would love to take a trip to Alaska or somewhere in Europe - maybe the Netherlands or Germany? Currently and fiancé and I are dreaming about Istanbul! I would looooooove to go to Hawaii! I spent my first Christmas there (but have no memories of it) so it would be fantastic to go back, see some family friends, learn to surf, and shoot all the gorgeous island scenes! FIJI of course !!! for the breathtaking SUNSETS! I really love your photographs! I'm hoping to make it to South America in 2015. Fingers crossed! Iceland :) I've aaaaalways wanted to go there. Also, these calendars are gorgeous! Taking an Inca history course right now. South America has great history! FIJI of course!!! for the breathtaking SUNSETS !!! I would love to visit Switzerland. Seriously probably the most beautiful country on earth. If only I lived there.. My cousin moved from Florida there to go to school and he posts some pretty amazing photos.. And I think he decided to stay, no wonder! I want to finally go to Hawaii after having to cancel my honeymoon there. And also Ireland. I actually have been dying to go to Seattle! Hopefully I'll make that happen as I'm on the west coast for a few months. I'd also love to visit Greece, Spain, or Croatia. i'd love to make a trip to europe with my family! I'd love to visit Thailand, Taiwan, and rural China because unfortunately, I didn't get to visit most of Asia during my semester abroad at the University of Hong Kong. Bangkok, Thailand holds the most beautiful lantern festival in November, much like the lantern scene in Tangled! Taiwan is known for its superb food culture with a bit of everything from across the globe. Rural China is adorned with undisturbed forestry, and attractions include rafting, hiking, and visiting small villages! I'd also love visiting South America (hence, I voted for the South America calendar!) because during my semester abroad, I wrote a research paper about the ancient American civilizations of the Aztecs, Inca, and the Maya! With my newfound knowledge on these tribes, seeing the ruins of their civilizations would be the frosting on the cake. Going to Patagonia and just can't wait! Visiting the Bahamas is my dream!